90 years ago, the Hamburg workers took up arms, and gave the signal for the socialist revolution in Germany through their uprising. 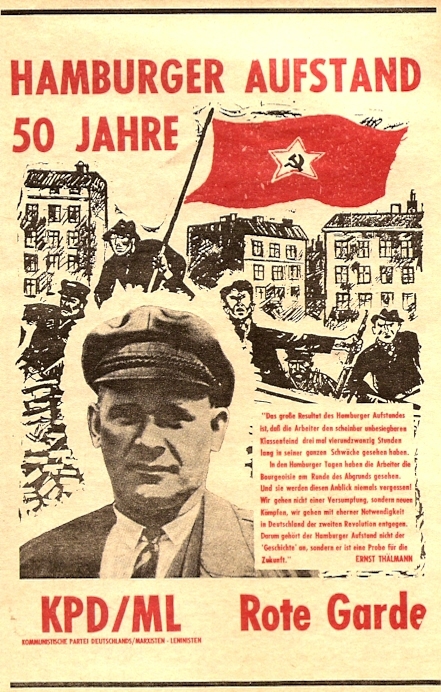 It was the first time that workers in Germany had organized an armed uprising under the leadership of the Communist Party with Ernst Thalmann at the top, and with the direct guidance and support of the Communist International - namely with the goal of the establishment of the dictatorship of the proletariat. Hamburg was in the hands of the workers! 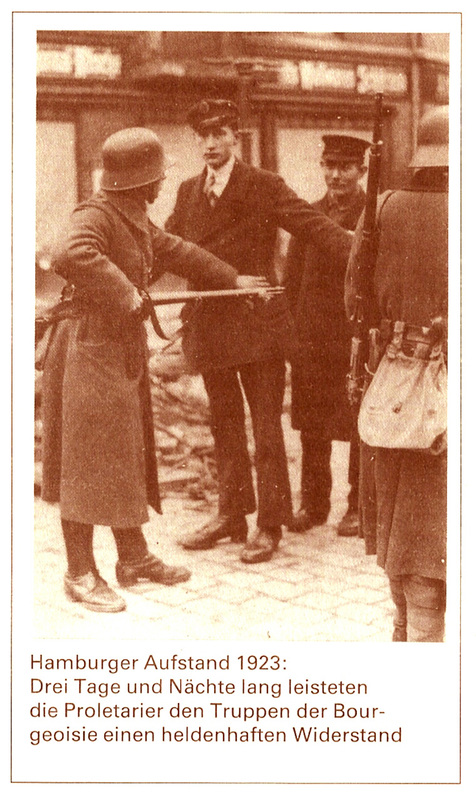 The Hamburg October fighters of 1923 turned the bourgeoisie on the brinks, but after three days, the workers decided their orderly retreat , because the spark of revolution did not spread out on a national scale. Thus, the defeat was avoided and a triumph of counterrevolution thwarted. 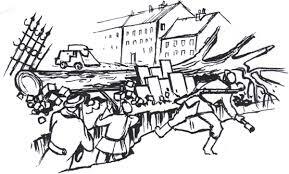 The Hamburg uprising was short-lived, but long enough to show the whole world impressively that their is no other alternative of shaking off the yoke of capitalism and to overthrow the bourgeoisie than the armed revolutionary violence of the proletariat. These teachings of Marxism-Leninism, which have already been brilliantly confirmed by the victory of the Russian October Revolution were consciously implemented in practice by the Hamburg workers. 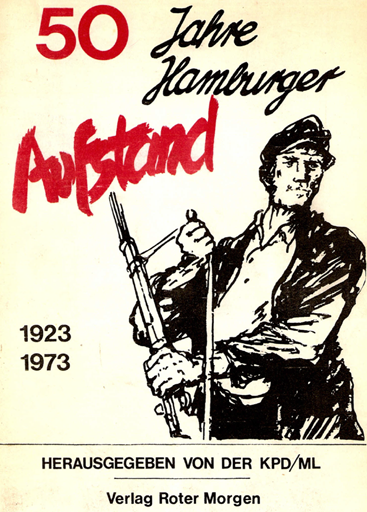 The Hamburg uprising was a higher form of armed insurrection because it was a socialist uprising led by the Communist Party as a Section of the Communist International, which was founded only four years ago. And this very fact expresses the internationalist character of the Hamburg uprising. 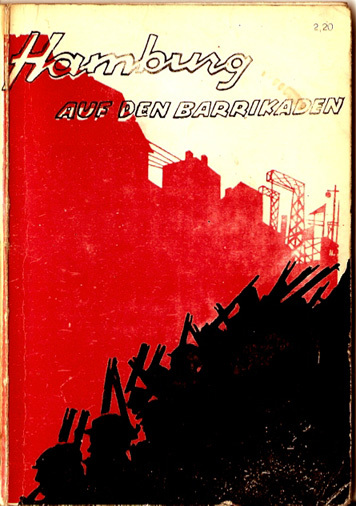 The Hamburg workers saw their role as the vanguard not only for the liberation of their city, not only as the shock troops of the German proletarian revolution, but primarily as the standard-bearer of the socialist world revolution in the capitalist world. 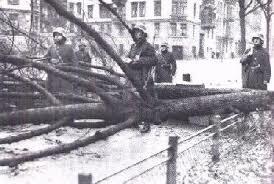 At the barricades, the Hamburg workers called to the world revolution ("Schiffbek appeal" of comrade Fiete Schulze who was murdered by the Nazis later on). Thus, Hamburg became the beacon for the proletariat all over the capitalist countries. 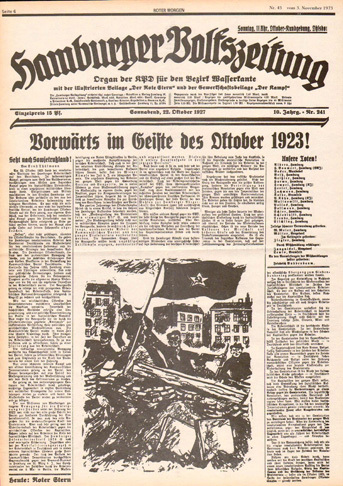 The Great October Socialist Revolution was the beginning of the world socialist revolution, and in Hamburg it was continued heroically. Lenin and Stalin had realized that the revolutionary situation in Germany was crucial for the victory of the world revolution, and that this, ultimately, could consolidate the triumph of the Revolution in Russia. That is why the Bolsheviks did their utmost to support the revolution in Germany without shying away from the hardest victims. Although the Russian proletariat itself was very hungry at that time, it sent a Russian grain steamer to the port of Hamburg to rescue the Hamburg proletariat from starvation - truly proletarian internationalism, indeed ! 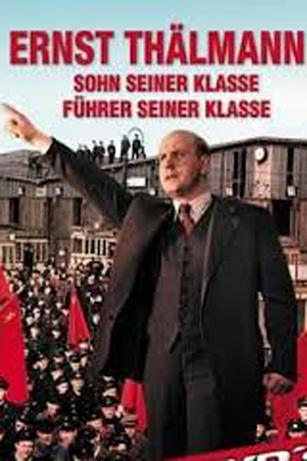 "The proletarian dictatorship was getting ready to render direct assistance to the German revolution"
The great heroism of the Hamburg workers is now documented in numerous writings, images and a movie ("Ernst Thalmann - son of his class"). We are proud to present the most comprehensive online archive of the world about the Hamburg Uprising in 1923. 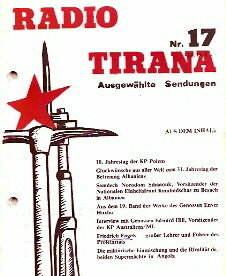 Among the writings, published by us, there are also those that were edited in the social fascist GDR. We have selected a few of them in which valuable historical material is included (only for the purpose of studies !). Of course, we must handle these texts critically, because we know that the revisionists (although in favor of the armed struggle by lips-service) deny and betray the Marxist-Leninist principle of the violent overthrow of the bourgeois class. Thus, the modern revisionists also betrayed our communist leader Ernst Thalmann! The betrayal of the Rightists and Conciliators within the KPD was finally one of the major reasons why the Revolution in Hamburg could not spread throughout the country on a national scale. The German proletariat was ready to move to the final battle, but the right-wing leadership in the Communist Party, Brandler - Thalheimer and Co., they attacked the German socialist revolution from behind. Concerning the social fascist regime in the GDR, our KPD / ML (which was founded in 1968 both in the spirit of Ernst Thalmann and the Hamburg Uprising) has been banned in the GDR and was declared "State Enemy No. 1". We Comrades of the KPD / ML were put in jail in the GDR, just like the October fighters were put in jail in Hamburg in the year 1923. This must not be forgotten ! Fascists and social-fascists are twins [Stalin] , the spawn of bourgeois evil ! Marxism-Leninism and the history of the labor movement teach us, therefore, that the dictatorship of the proletariat can be victorious only if our own revolutionary ranks get rid of the social-fascists and their counter-revolutionary influence. For us, the Hamburg uprising is not a dead object for dealing with the history of the world communist movement in a manner of scholarship . We are a fighting organization which defends the banner of the Hamburg Uprising bravely and which carries it forward - "class against class" ! We Comrades of the Comintern (SH) are fighters for world communism, we are the world proletariat's own flesh and bloodt, we are the vanguard, we are the next generation of street fighters ! We are the ones in the forefront who continue the heroic struggle for the revolutionary liberation of the world proletariat . The Comintern (SH) does not only propagate the neccessity and inevitability of the world revolution. We are, above all, the theoretical and practical organizers and leaders of the world revolution ! Finally, the world revolution has now already become an urgent problem that must be solved practically, and that will be solved successfully at any cost ! The German Section of the Comintern (SH) emerged from the KPD / ML of Comrade Ernst Aust and is the true successor of the great former German Section of the Comintern which was led by Ernst Thalmann. We of the Comintern (SH), are the successors of the glorious Comintern of Lenin and Stalin! The history of our Comintern (SH) is nothing but the continuation of the glorious history of the Comintern of Lenin and Stalin! What did comrade Ernst Thalmann said quite right ? "Anniversaries are for the communists and for the class-conscious elements of the proletariat not empty observances, but guidelines for the class struggle, a guide for revolutionary action. Especially the political situation in which we are now , forces us with imperative compulsion that we have clearly to recognize the historical significance and the teachings of the Hamburg Uprising." Forward in the spirit of the Hamburg Uprising of 1923! Allow me to make some personal remarks on this occasion. Hamburg was for me the "gateway to the world." As a ship's boy I went to sea at the age of 16 and got to know foreign countries and people. Hamburg, the town of the heroic proletarian uprising in 1923, is not only my birthplace, but also my "training school" where I was educated as a communist in the tradition of comrade Ernst Thälmann who was also a son of the proletariat of Hamburg. Since 1969 I fight day by day for the socialist revolution and since 1971 I am member of the KPD / ML in Hamburg - where I was working as a docker. Under the personal guidance of Comrade Ernst Aust, also son of the proletariat of Hamburg and founder and leader of our party, I was trained as a party candidate in his party cell in Hamburg-Bramfeld. At the personal suggestion of Ernst Aust, I was elected to leading positions of the party, and in 1985, after his death, as party leader. In 2000 I became founder the Comintern (SH). At this point, I would like to thank all the workers and comrades who have contributed to fulfilling my dearest wish, namely to become a professional revolutionary, in order to put myself at the service of the revolutionary liberation of the world proletariat for all my life. As a proletarian child I was born 4 years after the end of the war in the easternmost working-class district of Hamburg-Bergedorf. There is a street called "Ernst Henning Street". Who was Ernst Henning? He was a worker, a former in an iron foundry and an outstanding proletarian fighter of the 1923 October Uprising in Hamburg. He was the deputy of Edgar André, whose famous name is known from the Spanish Civil War. 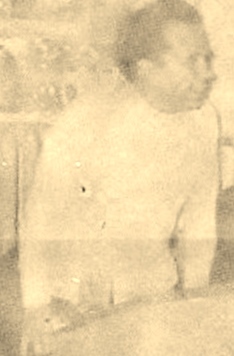 Edgar André was one of Ernst Thälmann's closest combat companions. As a member of the KPD district ""Water's Edge" [Northern Germany] (1926-1930), Edgar Andrè was one of the best revolutionary trade union leaders in Hamburg. Later, he was even a senior official in the International Seafarers 'and Dockers' Union. Edgar André was also co-founder and leader of the Red Front Fighters' League [Rotfrontkäpferbund - RFB] in the district of "Water's Edge" (1924 - 1929 banned). (By the way, the creation of armed "proletarian hundreds" was decided on Stalin's initiative by the Comintern in 1924 - as a result of the experience of the Hamburg uprising). After Hitler's seizure of power Edgar André was arrested on 5 March 1933 and sentenced to death on 10 July 1936 on Hitler's orders. On 4 November 1936 Edgar André was beheaded despite international protests. Immediately thereafter, the first battalion of the International Brigades in the Spanish Civil War was named after his name. Since 1927 Comrade Ernst Henning was a member of the KPD in the Hamburg parliament and also one of the leaders of the Red Front Fighters' League of the KPD. On March 14, 1931 Ernst Henning was shot dead by the Nazis on the street. About 100m away from Ernst-Henning-Steet I was born on the 6th of July 1949. There is also the "Ernst Henning School", which I once visited. 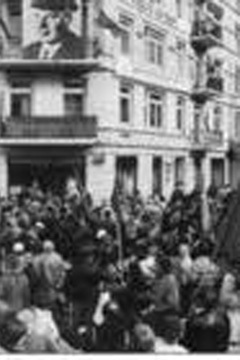 In Hamburg-Bergedorf, on 23 October 1923, demonstrations and plant occupations took place. The armed counterrevolution not only had to retreat but was besieged by the insurgents. A young worker (Comrade Jungnickel) was killed by the counterrevolution. Two years ago today, on 23 October 1923, Hamburg went on the warpath. Gearboxes the misery of the inflation time, urged by the unprecedented suffering of the toiling masses, supported by the spirit of Bolshevism reached the best, most revolutionary part of the Hamburger Workers for his gun and took the fight against the capitalist oppressors on. Two years have passed since 23 October 1923rd Much has played in Germany and changed throughout the world. 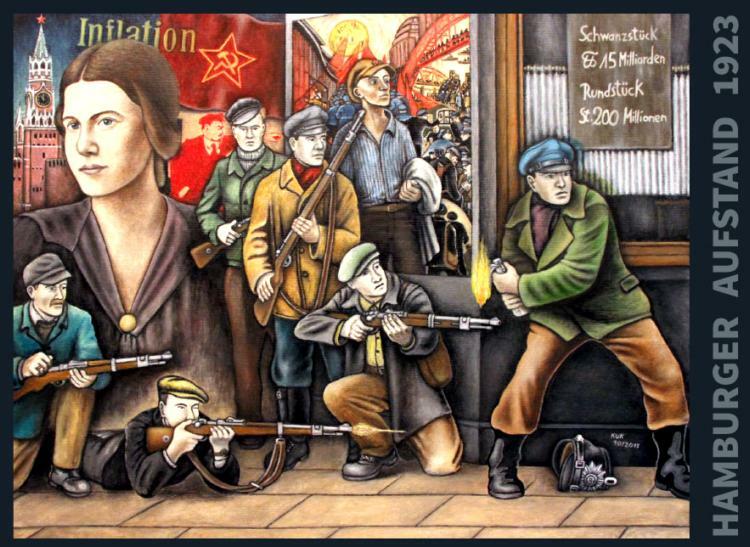 We, the Communists, beaten been with us the whole German working class. The stabilization of the bourgeois Germany has succeeded to some, limited extent. The bourgeoisie draws new Hope. The proletariat went through a year of discouragement and the retreat. 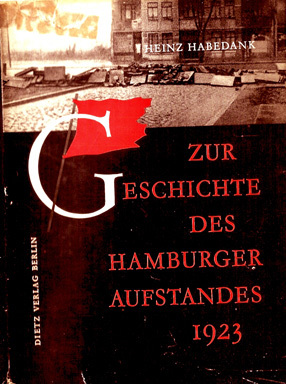 If we today commemorate the two-year anniversary of the Hamburger Straße struggle so happens not from the mere reason that the calendar of October 23 recurs. Anniversaries are not empty for the communists and the class-conscious section of the proletariat Observances, but guidelines for the class struggle, guides for action. Especially the political situation in which we are today, with calls imperious compulsion of us that We fully the historical significance and the teachings of the Hamburg uprising clearly seen. What were the causes of the Hamburg fight? Was it only the agitation of the Communists, it was the decisions of illegal secret organs such as the civil Courts say? No! The causes lie deeper. The uprising sprang neither the blind chance nor the free will of a few conspirators. 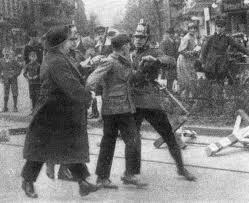 The Hamburg Uprising sprang the revolutionary situation in the autumn 1923rd . The fall of 1923 brought the deepest, most comprehensive Germany, all the layers and Classes of the population poignant crisis of the bourgeoisie. had the Entente imperialism his destructive work completed. 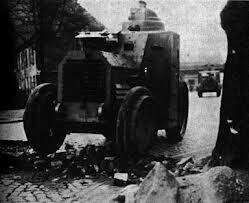 Ten-month Ruhr War was for the German lost bourgeoisie. The Mark currency, on the accession of the Chancellor Cuno standing on 8000, later increased to one trillion. The workers could no longer for their wages buy. Even "the most faithful servants of the state", the officials began to rebel. The Middle classes were ruined. The specter of famine passed through Germany. Powerless were the governments of the bourgeoisie to disintegration. 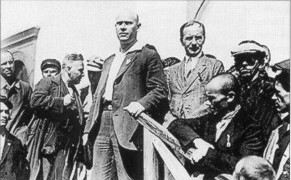 Stresemann, former foreign minister, said after the Cuno strike, "that his government his last bourgeois government in Germany would ". 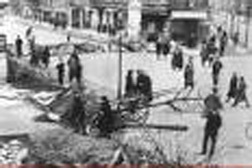 Already in the spring of 1923 began gigantic strikes in the Ruhr area and in Upper Silesia., New waves of class struggle rolled up throughout Germany. The Workers fought not for power, but only the most urgent Immediate demands to eliminate the most burning need. The struggle still took place mainly in "peaceful" forms. 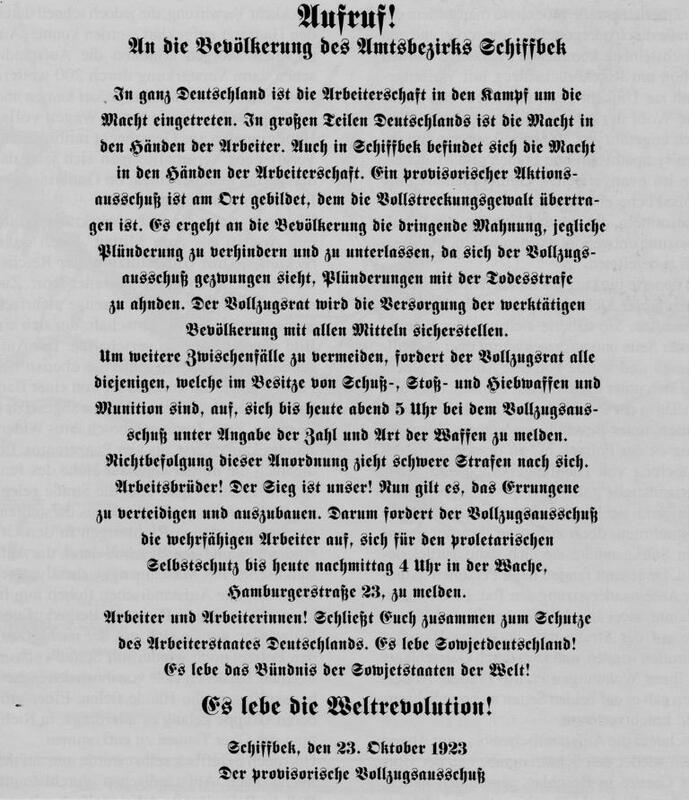 While the right Social Democrats, the target man and Severing, already in alliance with the Reichswehr generals and the chief of police for upgraded bloody crackdown of the proletariat, placed the "left" Social Democrats everything possible to make the working class defenseless, to prevent her power struggle with it fob phrases, they "peaceful" on, the parliamentary forms of struggle of Prewar push back. But the logic of five years of revolution was stronger than villainy right and the cowardice of the "left" social-democratic leaders. This moment we approached in October 1923 with uncanny speed. A immediately revolutionary situation existed. All conditions for the victory of Working class were there, except one: the existence of a clear, iron federated, indissoluble With the widest masses associated Communist Party that was determined and capable of the spontaneous struggle of Working masses together to organize it, to guide him. The leadership of our Party failed in the decisive hour. 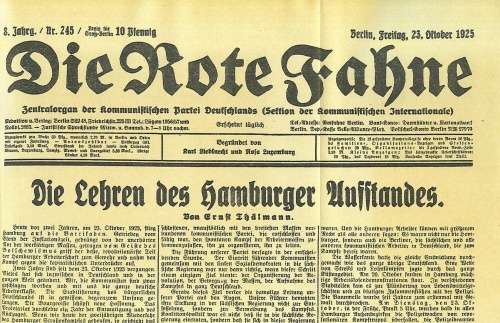 Admission leading Communists together with the "left" Social Democrats in the government of Saxony was only correct if this step was a single goal: organizing the Revolution, the movement of the masses, the recording of the fight in Germany. Just this goal lost the then leadership of our party from the eyes. Our guides used their position in the Saxon government not to unleash, but the Avoidance of the struggle. Coalition politics, it was not that they in the Saxon government occurred, but that they were outwitted and lead in this government, rather than the Working masses to lead in the fight against the German government. They forgot that the movement had to go through "into a higher form of struggle". They were limited to the "narrow frame", yes they even tried the narrow framework of economic and political struggles part still "close" to stretch. They gave the order, cancel existing strikes as "the decisive battle was imminent". Our party as a whole was still too immature to prevent these errors of the guide. So in the fall of 1923 failed the revolution by the absence of one of its most important Prerequisites: the existence of a Bolshevik Party. The Saxons policy ended with the defenseless retreat. The Reich executive, Invasion of the white generals, sealed the defeat. If so, the story of October 1923 exhausted? No and no again! Man committed later multiply the error, in resolutions and articles, and even in speeches before civil court to point to one of Saxony, when you spoke of October 1923rd. But there was not only Saxony but there was also Hamburg! 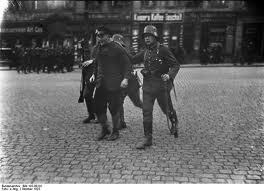 The Hamburg Uprising formed, as it says in the theses of the January executive from 1924, "The antithesis of Saxony". Those in the history of our whole Party to Frankfurt only the inability betrayal behold and opportunism, forget the tremendous doctrine of Hamburger struggle. They forget that the broad masses of our party members not in passive helplessness slept, but that they establishing their lives for to win the battle of power were determined. And the Hamburg workers can better right than any other say: It was not just the burgers, but also Berlin, the Saxon and all other communist workers in Germany, who were willing to fight. The water's edge had gone through the same development as the rest of Germany. A wave of strikes and wage battles chased by the whole coastal area. On 20 October mighty unemployed demonstrations took place in Hamburg. In different districts it came to looting of grocery stores and bloody Clashes with the police. The exclusion zone was for years for the first time by force breached. On Tuesday, October 23, in the morning, item 5 am, were soon in all Hamburg outskirts police stations occupied by revolutionary struggle squads, the police officer disarm all. All Vorrate of arms and ammunition from the twenty-six overpowered police guards took the revolutionary struggle with squads themselves. As the police headquarters his raiding parties and from outside already fetched reinforcements sent, were the battle areas in armed fortresses transformed. Hundreds of workers and working women built in the streets barricades. Immortal is boasting of red Barmbeck. Police troops marched in whole Companies and battalions, but they had to repeatedly without having achieved anything repent because their losses at each assault were larger. 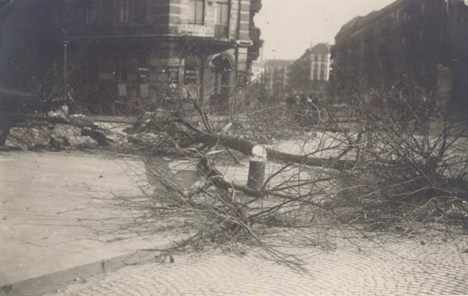 The Barmbecker workers had cut down trees, torn up the pavement, with tree trunks, stones and sand street entrances barricaded. Behind this rampart they fought like tigers. The first combat troops were unarmed when coup to the police stations. They itself brought the guns and the ammunition only by the police. 300 men were in the fast and barrage of 6,000 mercenaries of police, of the army and the navy. They There were three days and three nights. They shot three days and three nights. They attacked them fell, they went backward, but they did not surrender. They saved the honor of Communist Party of Germany. They were the price the German fencer Working class. Hamburg was beaten. The barricade fighters were knocked down. Although there have been just killed the best part was captured, persecuted and scattered. Sitting Today they in penitentiaries and forts. They gave by their heroic defense in Hamburg trials for high treason a prime example of how communists before the to bourgeois class dishes occur. The proletarian revolution has endured more than a bloody defeat. It is never it bleeds. It is stronger, prouder, more resolute paced. The Paris Commune was trampled. 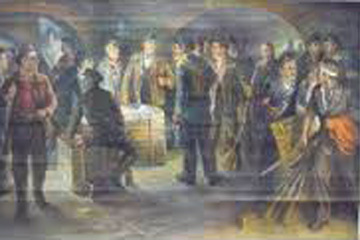 The Russian Revolution of 1905 ended on the gallows the Tsar, in the dungeons, in Siberia. And she woke up anyway anew! also Hamburg is not dead, but Hamburg is invincible. New uprisings of the proletariat, new victories the counter-revolution followed the German October. In Poland, Estonia, Bulgaria stood on the workers and were beaten. And yet they will win! The uprisings of the proletariat are stages on the victorious march of the revolution, not only by their immediate positive results, but mainly due to the great teachings, they hammer into the whole working class. What are the main lessons of the Hamburg uprising? 1. A numerically small crowd of proletarians who with great valor under the Banner dictatorship Fought has, could be used successfully against the twentyfold superiority Keep the shiny organized and armed troops of the bourgeoisie militarily. 2. The imperishable glory of Hamburg October fighters is that they in a revolutionary situation to take up arms attacked, although they are not to 99 percent in the victory the bag had. Leninism teaches that one must take up the fight, if serious present opportunities for victory. A guarantee of victory there is never in advance. The Defeat in such a struggle is a thousand times more fruitful and worthwhile for the future the class struggle as a retreat without striking a blow. 3. The uprising led to the defeat because he was isolated because he was not in Saxony and in whole kingdom was immediately supported. Let the workers in a single location with the greatest heroism, supported by the most powerful mass movement, take up the fight: you be beaten, if not the proletariat in the whole country goes with them. Just the fact in the organization and summary of the entire working class in all Industrial centers and major cities throughout the country beugtet the role of the Communist Party as a vanguard of the proletariat. Precisely for this reason we need an iron, completely closed, completely fused, strictly disciplined party. 4. It is not true that the Hamburg uprising was a coup, but he was supported by the Sympathy of the broadest masses supported. 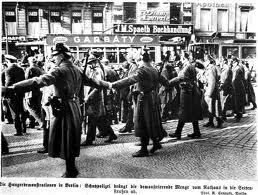 Even the police Senator Hense had angry admit that the Social Democratic workers in Hamburg, this rightmost organization the SPD [social democrats' party], and with them "the widest circles of the population, to the Communists held ". Our weakness consisted in the fact that we did not understand, these masses firmly around to rally us, they pull over time in all partial struggles to us that with them United front to close against the Social Democratic leaders. 5. In order for the inevitable coming recurrence Hamburger struggle in much to conquer a larger scale, we must like a wedge penetrate into the masses, they unite a thousand brackets with us, a real proletarian united front with make millions of workers. In the trade unions, in all non-party organizations Working class must grow a great revolutionary wing, which together with the Communists to support the upcoming fights will. 6. A particular deficiency was in the Hamburg days of October, the lack of a strong Rate movement felt. This fact is not yet sufficiently understood in the party been. The councils are the organs that in a revolutionary situation, the vast masses summarize the proletariat, which are the backbone of the struggle. This teaching may we do not forget even in the current period between two revolutions. 7. The seizure of power by the proletariat is not a single act. It is not only in the military fighting against the troops of the bourgeoisie, but they must go through years of prepared perennial work of the Communist Party and the whole proletariat will. The next winner over the bourgeoisie must by innumerable partial struggles, Organized educated, prepared. This is our main task in the present period. Despite Dawes Plan and guarantee pact - or rather because of Dawes Plan and guarantee pact. The capitalist stabilization in Germany is experiencing now their first "difficulty breathing". The great result of the Hamburg uprising is that the workers of the seemingly invincible Seen class enemy three times twenty-four hours in all its weakness have. In the Hamburg days, workers have the bourgeoisie on the brink seen. And they will never forget this moment! We do not go a Stagnation, but new battles, we go with iron necessity in Germany the second revolution counter. Therefore the Hamburg uprising belongs not "the History "to, but it is a sample for the future. 9. The uprising was a prime example of the glossy, smooth-working Organization of the revolutionary struggle. But he revealed at the same time the largest organizational failure of our party. The Hamburger fighters had the full sympathy of the workers the factories, but they had no organizational link with them. It showed all the uselessness, the fatal backwardness of our old social democratic living organization. The voting machine is not suitable for the barricades! 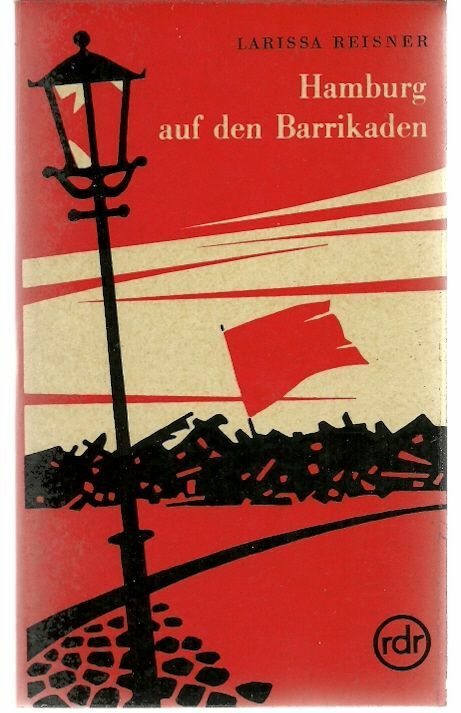 The most serious gap in Hamburg Battlefront was the absence of communist factory groups. A fighter flock, as the Hamburg, the the on entrenched cells in all establishments and the Association widest working masses is based, the future will be invincible in a similar situation. 10. 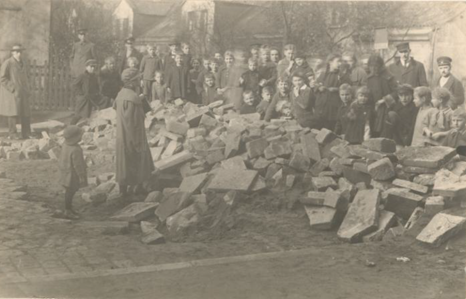 The largest, most valuable teaching of the Hamburg uprising is the grand fulfillment of Role of the Communist Party in the proletarian revolution. The Communists were not in words but in fact, the vanguard, the guide, the guide of Working class. They gave the movement a clearly defined goal, a precisely formulated Program: the dictatorship of the proletariat. In this respect, the Hamburg fight is on a far higher level than any previous movements. 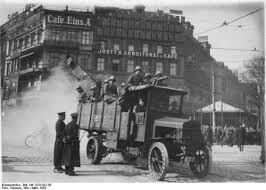 The March Action of 1921 for For holding out no comparison with the Hamburg uprising. Just because the party Leading the struggle had firmly in his hands, was of the Hamburger Revolutionary for the first time in Western Europe understood the Marx-Engels doctrine and realized that the insurrection is an art and the principal rule of this art, the daring, unshakable resolute offensive. These are the most important lessons of the Hamburg uprising. The cruel teaching money we paid for them was death and the imprisonment of our best. And yet: These sacrifices will be worth hundreds of times. They were not only to build a party of Bolsheviks brought in Germany but for the future of the entire working class. Instantly we are not in the period of direct storm, the immediate Struggle for the conquest of power. We are in the period between the first and the second revolution. If we analyze the world situation and the specific situation in Germany, so it is clear for any serious people that the present "Respite" will not last long. We must take advantage of them well, in order to learn our to expand forces to train ourselves and the working class, and the working class politically and organizationally prepare for the new Hamburg dates in all German cities are experiencing a tremendous recovery. Especially in the current period of the patient small struggle, tough, slow-growing we must part movements a minute the meaning and teachings of Hamburg Supervisors Tande Forget Our party takes a decisive change from the top down to the lowest depths. You eradicates from the sham revolutionary, word radical spirit. They eliminated the remnants of sectarianism, the contempt for the masses in their own ranks. They change their tactics to even tighter, more closely with the Social Democratic workers, to connect with the masses in the trade unions and in the factories. She goes to the complete transformation of their organizational bases zoom. She is working to create a large left wing in the labor movement. To fulfill these tasks we need especially the patient, painstaking, tenacious Daily work. Does that leave the line of policy of the Hamburg uprising? No! If we lose them, we are lost. Due to the transition to the policy of Mass production and the mass guidance we forge the class basis for another Hamburger uprising incalculably wider scale, of much greater importance, of more deeper historical significance as it was the first. More than ever, must in this period every German Communist, every party member, every Member of the Communist Youth League, every revolutionary workers and always adamant the image of Hamburg October fighter in mind have: cold blood, death-defying, the cause of the working class boundless devoted the gun in his hand, before the barricade, ready to receive the enemy and to look at a single target directed to the biggest, proudest goal that there is a communist: the dictatorship of Proletariat! 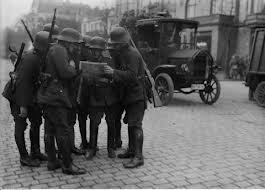 The high point of the revolutionary crisis of 1923 in Germany. 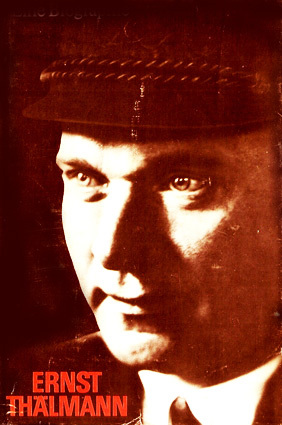 excerpt of the biography "Ernst Thälmann"
"Ernst Thälmann - Son of his Class"
"The great result of the Hamburg uprising is that the working class has seen the seemingly invincible enemy for 3 times of 24 hours in all its weakness. In the Hamburg days, the workers have seen the bourgeoisie on the edge of the abyss. And they will never forget that sight! We're not a stagnation, but preparing new struggles. We go with iron necessity towards the second revolution in Germany. Therefore, the Hamburg uprising is not a matter of 'history' , but a test for the future. " was created by the Hamburg October fighters. In the Year 1923 Ernst Thälmann was chairman of the KPD in Hamburg and deputy of "Seaside Germany". Forward in the spirit of October 1923 ! on occasion of the 90th anniversary of the Hamburg Uprising. This article is NOT included in the "Selected Works" - published by the modern revisionists !
" 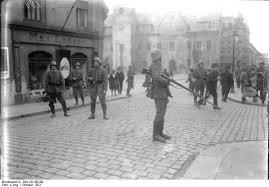 It was not the military superiority , it was not the social democratic betrayal that forced the Hamburg October fighters on their knees. In their own initiative, according to the consciousness that the revolutionary struggle against the oppressors could only be successfully completed on a national scale, the fight was stopped without great sacrifice when it hit its peak." 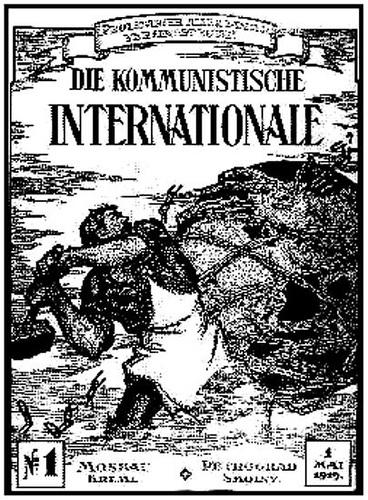 In the Year 1921, Ernst Thälmann took part at the World Congress of the Comintern, the first time. On the III. World Congress of the Comintern he met Vladimir I. Lenin in Moscow. 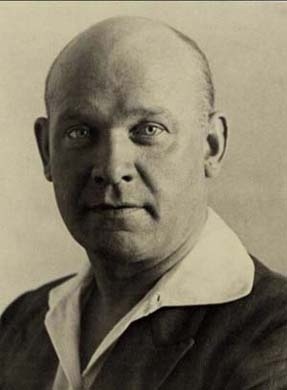 In the Year 1926, Ernst Thälmann was elected Deputy Chairman of the ECCI in Moscow. As chairman of the biggest Section of the Comintern ( outside the Soviet Union), Ernst Thälmann became one of the most famous Stalinist leaders of the world proletariat. He was betrayed by the Rightists and Conciliators in the Comintern and the KPD - however defended by Stalin. On August 18, 1944, comrade Ernst Thälmann was shot (in the age of 58 Years) by the SS in the KZ Buchenwald. "The Hamburg struggle was called off with exemplary discipline. Its lessons are valuable for the party and the Comintern. The communist party is the only revolutionary party; it is strong enough to prepare for and achieve the victory of the proletarian masses against all other parties; this must become the firm conviction of every party member. . . . The maintenance of party unity is imperatively demanded by the Communist International. The Executive calls on the entire KPD membership to do everything possible to see that at the party congress the entire party unanimously and resolutely liquidates all fractional struggles and achieves full capacity for action. The Executive of the Comintern reminds all members of the KPD and all other Comintern sections of the gigantic tasks arising from the present revolutionary crisis. It is firmly convinced that the experiences of the last few months have not been in vain and will, if seriously examined and evaluated, bring the victory of the proletariat nearer. Throughout Germany, the workers occurred in the fight for the power. In large parts of Germany is the Power in the hands of the workers. Also here in Schiffbek the power is in the hands of the working class. A provisional action committee is formed at the place to which the power of enforcement is conferred. The people are urged to prevent and refrain from plundering as the Executive Committee is forced to punish looting with the death penalty. The Executive Council will ensure the supply of the working population by all means. In order to avoid further incidents, the Executive Council calls on all those in possession of firearms, bullets, and ammunition to be present this evening 5 o'clock at the executive committee giving the amount of weapons. Report on type of weapons. Failure to comply with this order entails heavy punishments. Now it is time to defend and expand the achievement. Therefore, the Executive Committee calls on the able-bodied workers to report for the proletarian self-protection until 4 pm this afternoon in the guard, Hamburgerstraße 23. Join forces for the protection of the workers' state Germany. Long live the alliance of the Soviet states of the world! The Provisional Executive Committee "
of the military department within the Comintern. This book was not published officially. The name of the author is imaginary - "A. Neuberg"
excerpt of : "armed class-struggle in Germany"